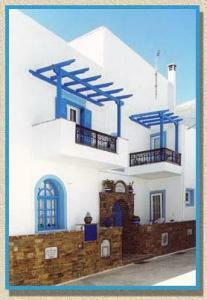 Pension Sofi is situated in the most picturesque area of Naxos Town (Hora) with a view to the Venetian Castle. It is a distinct accommodation and gained its reputation thanks to its hospitality and family atmosphere. Garden, Non-smoking Rooms, Free Parking, Safety Deposit Box, Valet Parking, Heating. Airport Shuttle, Laundry, Car Rental.